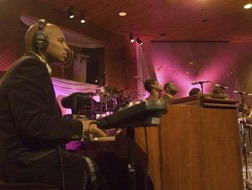 Terry Moore, the Executive Music Director at Salem Baptist Church in Chicago, is gifted with not only musical talents but blessed with the calling to please the Lord through a music ministry; creating and producing praise and worship music, leading others musically "into the holy presence of God", and sharing his musical gifts in music clinics, workshops and seminars for other church choirs and musicians wanting to learn and be inspired in their own efforts to create praise and worship music for the Lord's glory and praise. For Terry Moore has a love and dedication to the Lord which runs deeper than just his music ministry, as he strives to also please his Lord and Savior with all his given talents "in all facets of his life through living giving and teaching." The scripture which inspires Terry to fully glorify the Lord with all his given talents is Psalm 1:1-2: "Blessed in the man who does not walk in the counsel of the ungodly, or stand in the way of sinners, or sit in the seat of the scornful. But his delight is in the law of the Lord; and on his law he meditates day and night." Looking at Terry Moore's life and what he has accomplished for the Lord in his various endeavors and music ministry, points to a man who loves the Lord with his whole heart, and walks the talk with perseverance, dedication and obedience to the leadings of the Holy Spirit, for the glory of God. Terry Moore was blessed by being born into a loving family of committed, dedicated Christians, which gave him an excellent start down the road to becoming a servant of the Lord. Concerning his childhood and youth, the verse which comes to my mind is Proverbs 22:6 - "Train a child in the way he should go, and when he is old, he will not turn from it." Plenty of seeds of faith were planted in young Terry, as well as the values and exposure to folks who had a strong relationship with the Lord. Terry Moore graciously shared with ChristianMusic.com about his early life, when his family encouraged his spiritual development and encouraged the values which have helped to shape and guide Terry. The value of education and training was instilled in his formative years, which stood with him throughout his youth and young adulthood. ChristianMusic.com: Where did you grow up? Terry replied, "I grew up in Chicago, mid-city Chicago South Side actually. Born and raised. I went to public schools and I went to Catholic schools for part of my elementary schooling, and then high school at Morgan Park. I graduated, and then went to North Park College and seminary for three and a half years. I transferred, then graduated from Columbia College downtown, with a degree in Marketing." Did you grow up in a Christian home and /or have a Christian church family, or did the you find the Lord later? Terry Shares, "I've been in church my whole life. I was born and raised in church. My grandmother and dad were pastors. Now my mom and oldest brother are co-pastors. What talents or attitudes / character qualities were you encouraged to develop? Who in your life has been a source of guidance, reinforced your character, taught you your important values? Terry reflects, "Well, I was encouraged to live a life of integrity, live a holy life, a clean life through my dad, my mom, grandmother, aunts and uncles. Everybody was in church. They were musicians and singers at the time and that's who I patterned myself after." "My father; Rev. John H. Moore, Pastor James Meeks, my older brothers John and Tori, and different pastors around the country were my strongest influences. There are many pastors, ministers and men of God around the country who have influenced me but mostly my dad." Spiritual Influences: What has helped you grow spiritually In your adult years? "I've been in this walk with Christ for a long time, but since my dad passed in 2003 I've really grown and been drawn closer to God in my music, prayer life, and Bible reading." 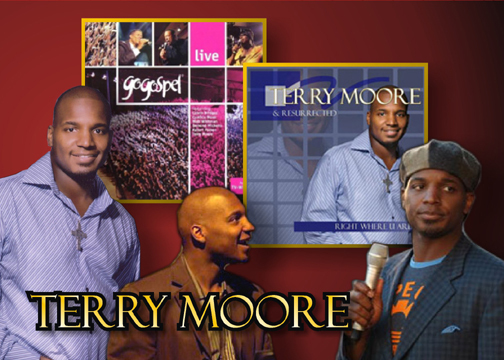 Terry shares with ChristianMusic.com about his early musical experiences, his musical influences, both gospel and secular music. What was your early musical experience? When did you start singing / playing the piano /organ / writing songs? First performances? "I started singing, playing (singing first) at the age of seven. My family used to have a group we're actually still together it's called the Moore Four. There were four of us, our last name was Moore and we sang everywhere in Chicago and abroad. I started playing professionally at the age of sixteen or seventeen with the Chicago Mass Choir at the time and then the Soul Children of Chicago, (Walt Whittman)." Musical Influences: Artists ( secular and Christian) which have influenced your singing style, performance skills and / or composing. Terry reveals, "I have a number of secular artists and gospel artists who influence me. My favorite two gospel artists would be Andre Crouch and Walter Hawkins, who I currently work and travel with now, Bishop Hawkins. Andre Couch has been a vital part of my music, training and growing up. I had an opportunity to work with him for several months at his church. He's had a great influence on our family so has Bishop Hawkins. There are other gospel artists but those are my favorite two." Other gospel artists who have "poured into Terry's career" include Yolanda Adams, Music Director:Rev. 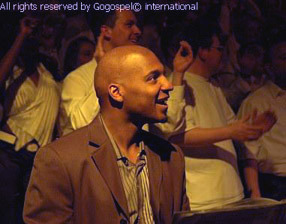 Darly Coley, Minister of Music:Rev. Milton Brunson and the Thompson Community Singers, Kurt Carr, Bebe & Cece Winans, Donnie McClurkin and Smokey Norful. Concerning secular artists, Terry shared, "I have a number of people I've listened to, in order to stay fresh with my chops and that kind of thing. People like George Duke, Sting, Yellow Jackets, Chicago, Journey and all of the pop artists out there. There are too many to name. But I also listen to Peter Cetera and Dave Foster to name a few." How did the Lord prepare you for your life of service through music? Terry explains, "By being in church all of my life. All I've been around is praise and worship music. We used to have a thing back in church called Testimony Service and people would volunteer and stand up at random and tell their testimony and most of the time it was accompanied with a song. That's how I learned most of the hymns and praise songs and that prepared me for what I am now." 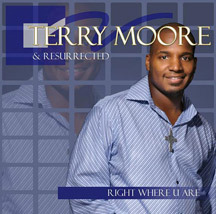 In 2007, Terry Moore released an inspiring collection of his music, in his album RIGHT WHERE YOU ARE CD, which truly does usher the listener "into the holy presence of God", giving us a sample of what it must be like to worship in Salem Baptist Church in Chicago, where he is the music director! Terry has dedicated this collection of 12 songs to his late father, Rev. John H. Moore. RIGHT WHERE YOU ARE CD, features TERRY MOORE & Resurrected Choral Ensemble who present some inspiring Contemporary & Urban Gospel worship anthems, praise and worship songs,which I bet have been tried out during worship services. In an upcoming review, ChristianMusic.com will explore why these songs are sure to gladden the heart, uplift the Spirit and feed the soul.